This hat is a great combination of beautiful and functional. This take on the basketweave stich is a striking pattern which evokes Celtic knot work. At the same time, this isn’t just another crochet beanie. The ear flaps will keep the hat on the head even in the strongest win, and make this hat appropriate for babies and toddlers. Sizes are provided from newborn to large adult. This project is of intermediate difficulty. For more free designs every day follow us on Facebook. Link to the free pattern and tutorial is below. Celtic Dream Earflap Hat – Free Crochet Pattern is here. Don’t forget to Like us on Facebook. Share your ideas and your work on our Facebook group! 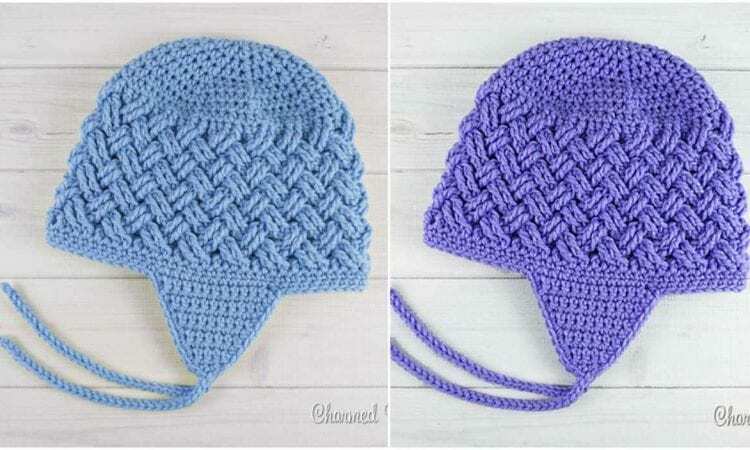 How to Crochet a Criss Cross Puff sew skullcap. Is there a way to download without installing a new apps. More apps just gets my hacked. I’m too old to learn new apps or whatever they are called. I do like your patterns though.